Welcome back, I’m Matt Champagne, and again we’re talking about the 9 principles of feedback and how you can easily apply these to the vehicles you are already using to gather feedback from your people, from your customers, members, clients, students, alumni. You can apply these principles to gather the most deep, meaningful and actionable feedback. And best of all, to create lifers. And in this video, I’m gonna give you 3 billion reasons why you need to choose lifers, so stay tuned to that. In our previous video we talked about lifers, we talked about how that’s the way to go. You don’t want just satisfied customers – satisfied, even very satisfied customers are always looking for the shiny new object. Lifers have these blinders on and you don’t have to worry about those sorts of problems. I want to thank everyone for the comments that they shared on that first video – those were great examples of bad survey questions. If you missed that first video, then you want to pause this one, go back and watch that first video; make sure you’ve signed up for this video series and then come on back to this now video too. We’ll be waiting for you. We’ll talking again about how to turn your satisfied customers into lifers. And you want lifers if you’re in customer retention, customer engagement, satisfaction, voice of the customer. If you’re an entrepreneur or small business owner – you’re the one closest to your people and you need your people to be lifers. And as I’ve said, I have 3 billion additional reasons why you want lifers and why you want to use the 9 principles of feedback. We’ve all heard this statistic, I think, that in the next 6-8 years there’s going to be 3 billion people coming on to the internet. 3 billion people who will have smart devices, who will have high speed internet, and they’ll be here with the rest of us. And when people hear this news they think ‘Well, that’s great – I’m going to have 3 billion new customers!’ I don’t think so. I don’t think this is 3 billion people with big sacks of money. These are 3 billion people who haven’t had the internet before – they have pent up desires and ideas. They want to make a better life for themselves and their family; they’re going to be entrepreneurs, they’re going to be building products, maybe some just like yours. They’re going to be creating services, maybe just like yours. Maybe not as high in quality as yours, but maybe cheaper, maybe more of it – this is 3 billion competitors coming online. So if you don’t have lifers and you have just satisfied customers who are always looking to the next shiny new object, that’s going to be a lot of problem. But we don’t have to wait 6-8 years, right? The abundance is here now. The exponential abundance of everything – that’s a term I stole from Peter Diamandez. But every product, every service has so many alternatives, there’s only so many shiny new objects out there. I have a web tool that I use that I pay $495 a year, and just in the past 6 months, 10, 12, 15 different companies have created products that are pretty much the same product. I had one of my assistants spend her time reviewing these products – I didn’t even have time to review them. That’s the kind of abundance that we live in. Now, this company does send me surveys. They call me, they send me email, they’ll say ‘Hey Matt, how’s it going? How is our product?’ and I say ‘Oh, great – things are going just great!’ but you know, I’m checking out the competition right now. That’s what satisfied customers do, they look for the next shiny new object. And I wish I could stay with them, they don’t use the 9 principles, so they don’t really know me, I’m not a lifer and so I’m moving on. That’s what satisfied customers do: they stick around long enough until they are pulled and they become somebody else’s lifer. You don’t want that happening to you, so that’s what this video series is about. To give you that secret weapon, to give you that unfair advantage of locking in lifers. Because when you have lifers, when you use the 9 principles, there’s no disruption. We’ve all heard about disruptions – Ubers disrupting the taxi industry and Airbnb is disrupting the hospitality industry. Well, there’s no disruption when you have lifers. You can’t disrupt your relationship. I told you in that first video that my wife loves Harley motorcycles. So it does not matter if Kawasaki or Suzuki comes out with a solar-powered motorcycle that costs nothing to run, she won’t even notice it. She is focused on Harley. If they came out with a 3D printed motorcycle that costs $100 and is throwaway my wife would never even notice; she’s not looking because she is a lifer. That’s what the 9 principles do, is not only give you that deep, meaningful insight into your customers, but it slowly develops that relationship with them to lock them in as lifers. I’ve heard people say ‘Well, Matt – we don’t really need the 9 principles. Why can’t we just ask? We’re already asking for feedback!’ Well, there’s a couple of reasons. One, is it is not systematic; you’re gathering bits of information from those who responded and then trying to determine what everyone is saying. You’re not hearing from everybody; you’re not hearing from them in a systematic way like you can do when you apply the 9 principles. It’s also more time-consuming. 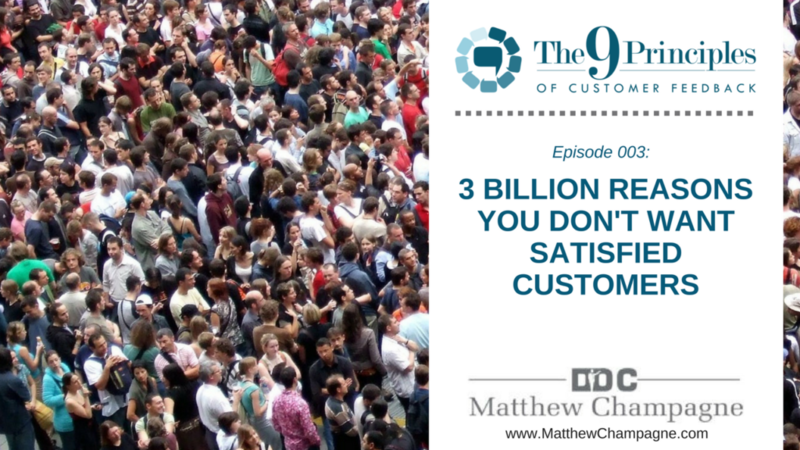 I talked earlier about what I call the endless churn of collecting data from your customers, your members, your clients, your students, your alumni, trying to figure out what’s going on, trying to monitor their satisfaction – it’s a time-consuming process, and a lot of this goes away when you apply the 9 principles, when you’re asking the right questions in the right way, to the right people at the right time, you’re getting that deep, meaningful information that you need. It’s kind of like if I were an instructor and I had 50 students in my classroom, and I want to hear from them, I want to make the classroom experience better, so I say okay, what can I do to improve this class? And one of the 50 students raises his hand and says ‘I think we should meet on Saturdays, which would be better for my schedule’ and I say ‘Okay, I’ve heard what you had to say, we’re going to meet next Saturday, I’ll see you then.’ Well, the other 49 students are like ‘I don’t want to meet on Saturday’ and I show up next weekend and there’s only 6 students in the class. And I think what went wrong? I heard from them, I was asking. Well, I made several errors – I made errors in gathering that feedback, I made errors in interpreting that feedback; I made errors in acting on that feedback. That’s not what my people said – I heard from some extremes and then I took action. That’s what happens when you have just the vehicle and you ask; you need the 9 principles so you’re asking the right questions, in the right way, to the right people at the right time – that gives you the meaningful, relevant, actionable feedback that you need. So as we did in video 1, I’d like you to apply these principles to what you’re doing right now, so get out a sheet of paper and a pencil; we’re gonna talk about principle 5, which is ‘Closing the loop’. It’s the most powerful principle, it’s that gravitational pull that brings your satisfied customers into lifers. And before we start, let me explain where Close the Loop came from. We were doing a service years ago for a large manufacturing company. They were training their own employees how to be better managers. So they had a classroom set up, and they were broadcasting that material by satellite to employees in 15 countries. And I said that we can provide a better experience for them by applying the 9 principles – we can get better feedback to make real time improvements while it still matters to the students. And they agreed, so the instructor gave his first morning’s lecture. And then he said ‘Okay, before we go into the break, fill out that form in front of you’ and it was a form that we have created according to the 9 principles, asking them questions about their experience with the class so far. He said ‘fill out that form and submit it and after lunch we’ll start with session 2’. So all the students filled it out, wherever they were in the world and submitted it. When the instructor came back, he had in front of him an at-a-glance report that we had created, and he read from it and said ‘Okay, I hear from my students in Brazil that you don’t like my jokes about the Yankees, so I’m gonna cut out that humor. And students in the Netherlands, I thought this was review for you, but I see it wasn’t so I had somebody at your site get you up to speed, you should be caught up now. And I see that the majority of you thought that material was review, so we’re going to skip over some topics in the afternoon session’. And the students were amazed – students from Brazil and Australia and all around the world were thinking ‘Wow, that instructor heard what I had to say, and made some changes’. We did this for each of the next 3 days; they would teach in the morning and then out would come our request for feedback and then we would feed it back to the instructor who would then close the loop – he would address their feedback, show all the students how he’s going to make changes, even how he wasn’t going to make changes and the students loved it. That course was rated the no.1 course ever given by that company. That instructor was rated the no.1 instructor; the students thought it was the most meaningful experience and it had these ripple effects because now they knew that the company cared about their learning, they took more training programs, and when we followed up with them 2 and 3 years later, they were still more satisfied with that training. That’s the power of closing the loop, to let people know that their voice was heard and demonstrating what changes you’re going to make, or what changes you’re not gonna make based on their feedback. Closing the Loop has a particular meaning, it’s a term I coined back in the 1990’s. I see it inconsistently applied now. But get out a sheet of paper and a pencil and I’ll explain how to correctly apply, close the loop principle to what you’re already doing. Now, this principle is based on the fact that people need knowledge of results. If there’s no motivation, there’s no learning, if there’s no knowledge of results, and that’s what Closing the Loop does. So you’ve already collected your data from your respondents, you asked them the right question as we described in video 1, you have all your responses back, now you want to close the loop. You want to show them that their voice was heard, that it made a difference and there’s lots of methods you can use. The easiest one, I think, is called Cherry Picking where all you got to do is go through their comments – this is especially helpful if you have a lot of comments and what you’re looking for is 3-5 examples of interesting points. 3-5 examples of things that you could change, that you might want to change anyway. You’re also going to look through that same list, you’re going to find one or two things that you cannot change; two things that you want to explain to them why this can’t be put into place. And once you have these nuggets in place, you’re set. You don’t need to gather comprehensive information to feed that back, you don’t need to tell your people confidential information – but just looking for these nuggets, that’s all the principle needs – is to let them know that you heard what they had to say. So what you’ll do is go back to your people via whatever way you’ve collected the data: it might be a web-based survey or email, and you’re going to communicate these results with them and you’re going to share with them these 3 things that you can change and say ‘I heard what you had to say, and this is an interesting idea – I think we’re going to put this into place. And this is what somebody else had said, and this is interesting, I haven’t heard that before, and let’s play with that a little while’. And you’re also going to tell them what you can’t change – that’s key too. And we have found over and over in all the empirical data just telling people their voices was heard was enough – even if you tell them you’re not going to put their feedback into place. So now you can tell them one of the nuggets you’re not going to change and say ‘I heard what some of you said and I know you think that’s going to be important, but I really don’t run my program this way’ or ‘I know that sounds interesting, but in my experience that doesn’t work really well – but I heard what you had to say, we’re just not going to implement it’. But that’s enough, they were heard. It’s like they were giving you a gift, a gift of time and they just want the thank you card. If somebody sends us a gift, they expect a thank you card. If you send someone a gift and you don’t get a thank you card, are you going to give a gift the next time? You might want to think about that twice. And we’re asking our people for their gift of time, so all we have to do is send them the thank you card back, which is simply some nuggets: here’s some things I heard, here’s some things we are going to apply, here’s some things we can’t apply. It is so effective for not only impressing your folks, but getting them to respond again and again. Again, it’s another step towards creating lifers and drawing them to you. Now, this whole process doesn’t take long. That story I told you about the company that was doing the training across 15 countries and we gathered all that data, well I left something out: that was done in 1997 and the forms that people filled out were on Lotus Notes. Does anybody remember Lotus Notes anymore? And when that data came in, it was coming into my grad students in the lab who were writing HTML code furiously to craft a report that they then faxed to the instructor. And it was done in 1 hour. That was hard. Today with techs and apps and smartphones and instant communication, this is much, much easier. So it doesn’t take long and you just need to give that thank you card to those individuals. You don’t have to respond to every piece of feedback, you just give them the thank you card for sharing the gift of their time. So, it takes some time to apply that today to what you’re already doing – I’d love to hear the results.